Located centrally between Kagoshima and Fukuoka is Kyushu’s third biggest city, Kumamoto. Kumamoto has all the conveniences of big city life and the comfortable feel of a small town. It’s central location in Kyushu and the fact it’s a shinkansen stop make Kumamoto not only a great place to visit, but an easy place to live. From the shinkansen station, one can find the Kumamoto City Tram, a great way to explore the city with ease. There are three major shopping arcades throughout the city which offer a number of department stores, cafes, karaoke establishments, restaurants, and izakayas. However, the star attraction is definitely Kumamoto Castle one of the most impressive castles in all of Japan. It features stone walls and moats, two towers, and around 800 cherry trees. It’s a popular destination for cherry blossom viewing in March and April! Sadly, Kumamoto Castle experienced structural damage during an earthquake in April of 2016. Despite the damage, visitors can still view the impressive outer fortress and the castle grounds also offer great views of the city. You might also be familiar with Kumamoto’s beloved mascot, Kumamon. 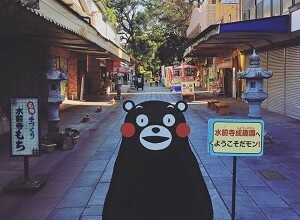 Kumamon is a cuddly black bear with a big smile and rosy red cheeks. He is well known across Japan by both children and adults. Be sure to visit Kumamoto for a chance to see this superstar throughout the city! What do you like most about life in your city? Kumamoto is the perfect size: not too big, and not too small. It doesn’t have the crowds that a city like Tokyo has, but it isn’t lacking for things to do, either. It has a much more relaxed atmosphere. On the weekends, I usually relax with a book, or take a trip somewhere new. The train system is very convenient for people who suddenly decide to take a quick trip. Some weekends, with no plans, I find myself at the train station picking a station at random. If you’re open to jumping on a train, you never have to spend too much time at home.